One of the largest recorded volcano eruptions ever is the eruption of the Krakatoa in 1883. Two-third of the original Krakatoa island, situated in the Sunda Strait between Sumatra and Java, vanished after the eruption. Tsunamis caused by the eruption killed over 36,000 people in the wider area. 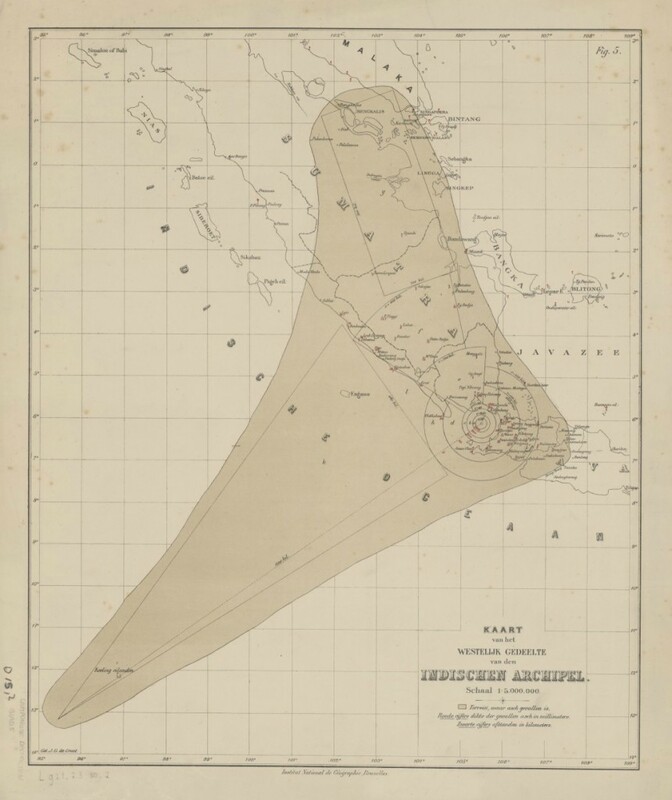 By order of the Governor General of the Dutch East Indies, the National Geographical Institute in Brussels (surprisingly not the Topographical Bureau in either Batavia or The Hague) published a series of 43 maps, plans and graphs on 12 sheets in relation to this natural disaster. This map shows the terrain where ashes were distributed, as far as the Cocos Islands, 1200 kilometers away. The red numbers indicate the thickness of the ash layer. In the direct environment of the volcano the ash layer was more than one meter. Other maps in this series show, among other aspects, the parts of the original island that were vanished, the distribution of the tsunami waves and the flooded coasts in the Sunda Strait area. It shows the water depths before and after the eruption. Drawn in 1886 by J.G. de Groot. The red lines are the borders of the part of the vulcano that crumbled. Red numbers the water depths after the eruption. a line with 100 under it means no ground at 100 meter. They apparently couldn’t measure deeper than 100 meter (which I think is pretty deep without modern technologies! ).